Venetian Plaster and Faux Finishing Techniques|Faux Painting and Venetian Plaster|Distinguishing Between Venetian Plaster from Faux Finishing Venetian plaster is a wall and ceiling decorative finish, which consists of plaster mixed with marble dust, applied with a spatula or trowel in thin, multiple layers, which are then burnished to create a smooth surface with the illusion of depth and texture. 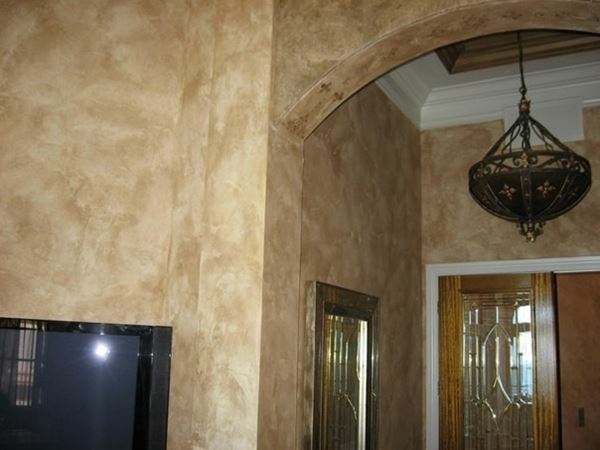 The result of unpolished walls using Venetian plaster technique is a matte finish that is rough, stone-like, brittle and can easily be damaged. Where marble panels could not be easily installed or on surfaces that would be too expensive to carve from real marble, such as columns, corbels, and curved walls, venetian plasters are used as an alternative finish. Tinted or colored Venetian plaster are oftentimes produced using natural or synthetic colorants, in which this technique is especially helpful when a specific marble color is desired or when a color that does not exist naturally is required. After a couple of years, when natural, lime-based Venetian plaster is applied on walls, it will eventually return to its original state, which is lime and marble, which is an indication of its authenticity and also distinguishing Venetian plaster from a faux finish. Since lime plasters perform extremely well in wet climates by allowing any water that is absorbed into the plaster to quickly evaporate and exit the structure, they are also called in Italy as Italian Venetian plasters, since they are good choices for surfaces that are always exposed to moisture, like in the damp and canal-side applications in the Venice lagoons. Unlike paints, which must be re-applied over and over, Venetian plaster is a lifetime finish, since the material is self-healing, much less likely to crack than cement finish, and naturally mold-resistant, thus resulting in beautiful walls that can withstand the test of time. Faux painting or faux finishing refers to decorative paint finishes that replicate the appearance of materials such as marble, wood or stone, such that this finishing technique has subsequently come to encompass many other decorative finishes for walls and furniture, including simulating recognizable textures and surfaces. The following are the different techniques, which are derived from faux finishing: faux marbling (used to make walls and furniture look like real marble), fresco (uses mixture of tint and joint compound to add mottled color and subtle texture to plain walls), graining (used to imitate exotic or hard-to-find wood varieties), color wash (using multiple hues of glaze blended together with a paint brush), Strie (glazing technique using a paint brush to create soft thin streaks of color), rag painting (using twisted or bunched up rags to create a textural pattern), and sponging (free-form finish achieved by applying glaze to the wall by dabbing a sea sponge).